Months after newly elected Pope Francis moved into a modest Vatican guesthouse in lieu of the Apostolic Palace, Newark’s new coadjutor, Archbishop Bernard Hebda, made a similar choice, declining a comfortable seminary residence and settling into a one-bedroom dorm. Archbishop Hebda embraces Pope Francis’ exhortation that priests be “shepherds living with the smell of the sheep,” several people close to the archbishop told The Catholic Spirit. For the Pennsylvania native with blue-collar roots and a Harvard education, a man who became a lawyer before he entered seminary, dorm living was an attractive alternative. It meant he got to rub elbows with students every morning while he waited in line for coffee at the campus Dunkin’ Donuts and hear about their days when he joined them for night prayer in Xavier Hall. This is a bishop who loves to be among the people — slipping into a table in the back corner of a reception hall rather than the reserved seat up front, sliding into a shadowed pew at Mass rather than concelebrating on the altar, joining a group of catechists at a picnic after completing his many duties. But he doesn’t skate by on charm. He does his homework. 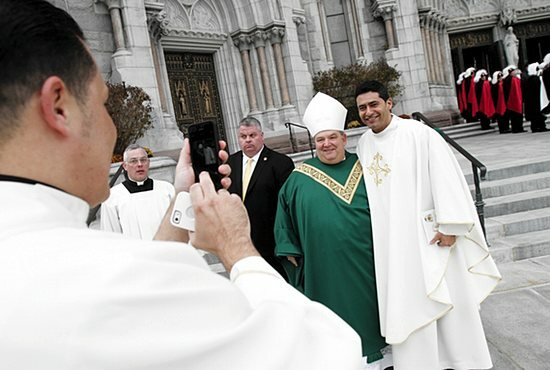 In a meeting on his first day as Newark’s coadjutor, Archbishop Hebda shared statistics on archdiocesan seminarians, recalled Newark Auxiliary Bishop Manuel Cruz. “He’s a man who takes things very seriously and pays attention and learns,” he said, adding that Archbishop Hebda is sensitive to other cultures and reads Spanish in a superb Mexican accent. The archbishop’s humility and curiosity make him a perpetual student. He once asked a biology major at Seton Hall University to weigh in on a New York Times article he had read on genetics. As bishop of Gaylord, Michigan, he secured a grant to enroll his priests in the Catholic Leadership Institute’s “Good Leaders, Good Shepherds” training program and attended all but one of the 28 sessions with them. The night of his sole missed session, he asked an instructor to brief him on what was covered. Career snapshotBorn in 1959, Archbishop Bernard Hebda grew up in Pittsburgh, earned a political science degree from Harvard and then studied law at Columbia. After working as an attorney for a year, he entered seminary, receiving most of his formation at the North American College in Rome. He was ordained in 1989 for Pittsburgh and soon returned to Rome to finish studies in canon law. 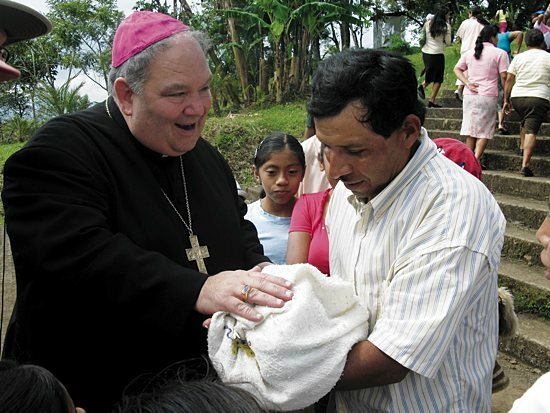 By 1990 he was back in Pittsburgh, and in the following six years gained a range of experience, from parish and college ministry to a role in the diocesan tribunal. He returned to Rome in 1996 to work at the Pontifical Council for Legislative Texts, which interprets the Church’s laws. He was named the council’s undersecretary in 2003. 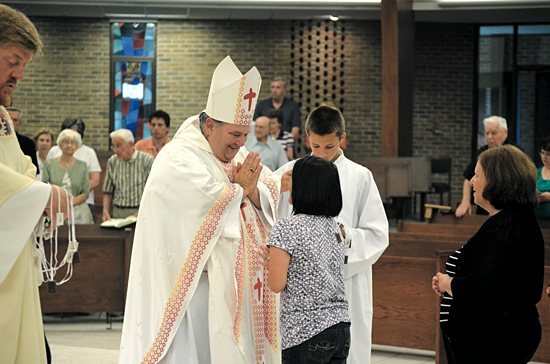 Six years later, he was installed as bishop of Gaylord, Michigan, and then in 2013 was named coadjutor archbishop of Newark, positioned to lead the diocese upon the retirement of 73-year-old Archbishop John Myers. Archbishop Hebda was ordained a priest in 1989 by then-Bishop of Pittsburgh Donald Wuerl, who is now a cardinal and head of the Archdiocese of Washington. Cardinal Wuerl tapped him to be the face of the diocese in 1990 by serving as master of ceremonies for liturgical events such as confirmations. Cardinal Wuerl said he enjoyed the priest’s company as they drove around the diocese and his ability to sniff out a good frozen-custard joint on the way home. The fact that he was not legalistic or bookish but such a people person is why the cardinal encouraged him to study canon law in Rome, completing a licentiate at the Pontifical Gregorian University in 1990. As an archdiocesan employee in Newark, Repollet found him a true collaborator, never an adversary. “He’ll say, ‘These are just suggestions, but this is how I feel about what was written,’” she said. She describes him as a leader who is thoughtful and thorough. He diffuses tension with humor but never sugar coats, Repollet added. 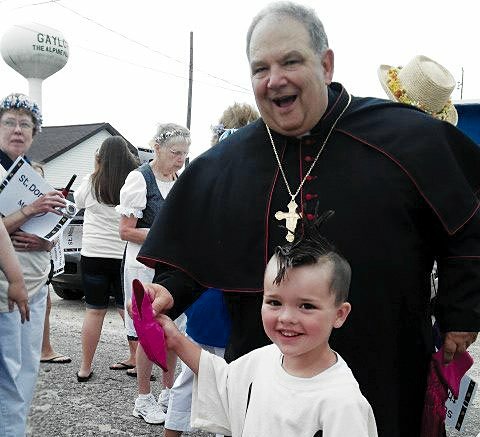 As a preacher, Father Vallone said, he’s not afraid to challenge. All those talents equip him well to guide the Archdiocese of St. Paul and Minneapolis through a difficult juncture, Cardinal Wuerl said. “I think the people of St. Paul-Minneapolis, when they come to know Archbishop Hebda, are going to see in him a real shepherd whom they can love,” he said. When Peter DeMarais met Archbishop Bernard Hebda in 2013, the graduate student introduced himself as a missionary with a Catholic formation program called St. Paul’s Outreach. Not only did the name ring a bell with the archbishop, but the face also did. That retreat had taken place in 2007, “Fan into Flame,” a St. Paul’s Outreach service led by the SPO lay team — then 19-year-old DeMarais among them — for some 200 seminarians, transitional deacons and priests in Rome. DeMarais, a lifelong parishioner of St. Louis, King of France in St. Paul and a 2011 graduate of the University of St. Thomas in St. Paul, was floored that the archbishop remembered him. Newark’s new coadjutor archbishop had participated in two SPO retreats during his time in Rome and expressed his appreciation for a retreat led by lay people offered for clergy. Once installed in Newark, he proceeded to be an enthusiastic SPO supporter, attending two benefits and visiting the men’s house for a steak dinner. Now that Archbishop Hebda is serving the Archdiocese of St. Paul and Minneapolis, he finds himself in the city where SPO was founded and remains headquartered. “It’s one of those connections you never could’ve planned, but I guess the Spirit is moving,” said Edward Moccia, senior mission director for St. Paul’s Outreach New Jersey. When they last met, Archbishop Hebda asked Moccia if SPO did any post-college work, perceiving the need to guide Catholics in their mid- and late-20s as they discern their vocations and set out to fulfill them. « Religious liberty: What are the threats, and what can Catholics do?